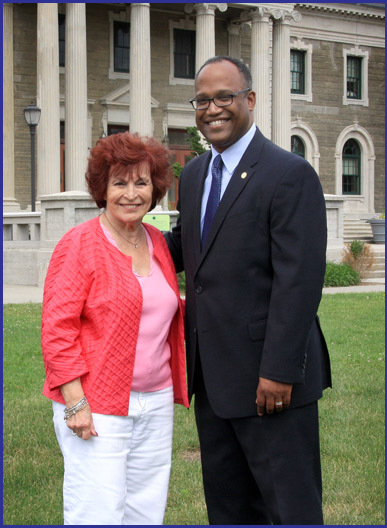 Nassau County Legislature Presiding Officer Norma L. Gonsalves met with Suffolk County Presiding Officer DuWayne Gregory in the first of a series of meetings to explore ways in which the two counties can cooperate to improve services and cut costs islandwide. The Presiding Officers discussed the establishment of a bi-county efficiency task force to explore cost-saving opportunities throughout every department in each county. Nassau and Suffolk recently passed legislation to create the Long Island Commission for Aquifer Protection, which will assess threats to the sole source aquifer that provides drinking water for both counties. Among the other possibilities explored were - joint purchasing possibilities, ways to cut out-of-county tuition costs for community college students, and sharing facilities, such as the possible use of Nassau County’s Juvenile Detention Center to house some Suffolk youthful offenders when needed. “I thank Presiding Officer Gregory for traveling to Mineola for our first meeting, and I look forward to working closely with Suffolk County in the future,” Said Presiding Officer Gonsalves.